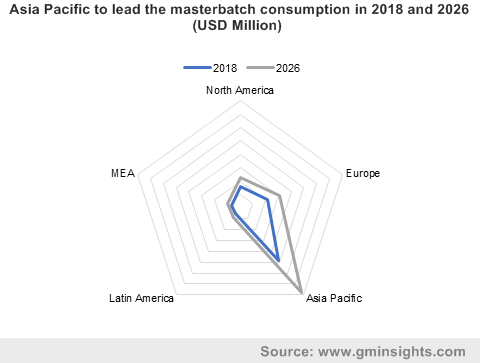 Masterbatch Market size will likely surpass USD 13 billion by 2024; according to a new research report by Global Market Insights, Inc.
Masterbatch market is most likely to witness growth in the forecast period due to rising demand for biodegradable masterbatches. These superior products help the plastic material to degrade after completing its shelf-life, are non- toxic, cost-effective, and ideal for food and drugs packaging applications. The biodegradable products are used for manufacturing environment friendly agricultural films, popularly used by farmers to improve the crop production rate, maintain soil moisture and control different weathering conditions. Stringent environmental norms implemented across the globe will drive the market for biodegradable products in food, agricultural and healthcare industry. Strong demand in the automotive industry, especially from the developing countries would positively impact the masterbatch market size in the study period. This is due to the wide usage of the product in production of auto parts. Switching metal parts with plastic components is driving the product demand in the automotive sector. Using plastic components enables the automotive manufacturers to cut down their weight as well as cost and makes vehicles more affordable to the public. Increasing innovation in the masterbatch products would enhance its quality and increase the applications. This would further increase the demand for the product in the coming years. Additive is a significant product type in the masterbatch market, and is likely to generate revenue exceeding USD 1 billion by 2024. Additive product types are used to introduce specific performance characteristics to plastic components, and includes heat stabilizers, flame retardants, anti-oxidants, stiffening agents, anti-microbial solutions, optical brighteners, anti-foggers, corrosion inhibitors, and various other options. These products help to improve the strength, quality, look, and feel of the product in different end-use sectors. Packaging is one of the most significant end-user segments in the masterbatch market which is likely to grow by around 5.5% CAGR from 2018 to 2024. It is used in a varied range of applications such as food & beverage containers, medical bags and boxes, security packaging, etc. Growing demand from the rigid and flexible packaging sectors will signify the segment growth over the coming years. North America masterbatch market value is likely to reach around USD 2 billion by 2024. Product demand in this region will witness decent growth on account of the developing construction and automotive sectors of the region. Key product manufacturing companies in the masterbatch market include Cabot Corporation, Clariant, Hubron, PolyOne, Penn Color, Ampacet Corporation, A. Schulman, Inc. etc. Large number of small and medium scale local manufacturers are also present in this market.